Renowned marketing strategist Al Ries and his daughter Laura believe in the power of public relations. In their book entitled The Fall of Advertising and the Rise of PR, they effectively argue that public relations techniques should be the tools of choice when establishing a brand but fall short in their advice that advertising should only be used as brand maintenance. Businesses have traditionally viewed advertising as the tool of choice when creating and establishing their brands. The advertising budgets of most companies are evidence of this fact. Total advertising expenditures for 2004 exceeded 140 billion dollars. Conversely, a company’s public relations efforts have often been viewed as a support function to advertising. This trend continues today throughout the corporate world. Even within the halls of higher education, students are taught that public relations is a subset of advertising. Al and Laura Ries disagree. The authors begin their book by explaining that the golden era of advertising is over. During this golden era, the years following World War II, advertising volume increased. Later, with the advent of television, the amount of advertising exploded. The authors claim that it is because of the influx in advertising volume that its effectiveness declined. Another reason advertising lacks effectiveness, the duo argue, is that the advertising industry has lost its focus. They claim that advertising’s purpose has shifted from generating sales to generating creative ads. The authors assert that advertising agencies are more concerned with winning awards than anything else. They mention that the average advertising agency spends more money on award entries than on independent consumer research. The main point of The Fall of Advertising and the Rise of PR is that public relations methodologies are extremely effective at building brands and advertising is incapable of building a brand. To illustrate this point, the authors refer to the many dotcom failures of the late nineteen nineties. In particular, the authors single out Pets.com. Pets.com sold pet supplies to pet owners. The owners of Pets.com decided to let advertising build its brand by hiring an advertising agency. The agency created the Sock Puppet, which was revered among the advertising community and its critics. The Sock Puppet ads won many awards but it did not generate sales. Eventually, Pets.com went bankrupt. Why is advertising not effective? Ries and Ries propose that advertising has lost its credibility. The authors suggest that advertising is perceived to be one-sided, biased and company-oriented. Both father and daughter correctly point out that consumers are looking for trusted, unbiased, consumer-oriented communications. Only public relations can fill this need, not advertising. The main goal of a public relations campaign is to get a company and its product mentioned and recommended by third parties. Third parties include newscasts, newspapers and magazines, which tend to be consumer-oriented. Since the media is not affiliated with the company, people are more likely to accept the opinions and ideals of the public relations campaign. A public relations campaign also uses another trusted third party source – word of mouth. Research shows that consumers are more likely to buy products and services that are recommended by people they know. Does advertising have a purpose when it comes to building brands? Yes, both Ries and Ries suggest that advertising’s role is that of a support function and continuation of public relations. In other words, advertising is not brand building, it is brand maintenance. As the authors put it, “A brand is born with the capability of creating ‘news.’ This is the essence of a new brand. But what happens when a brand grows up? It runs out of publicity potential.” It is during this time when companies should implement advertising. The Fall of Advertising and the Rise of PR effectively presents its argument that only public relations can truly build a brand. The authors draw from their professional experience to illustrate past public relations strategies that have established brands and how advertising has traditionally failed at brand establishment. However, there are certain cases in the book that are untested and unproven. These cases end up sounding as ‘If it were up to me…’ scenarios. Also, some of the suggestions by the authors are entirely unrealistic. One of their suggestions to bring more tourism to Guatemala is for the country to change its name to Guatemaya to represent its Mayan heritage. Regardless of such outlandish commentary, The Fall of Advertising and the Rise of PR will motivate public relations professionals and incense advertising executives. 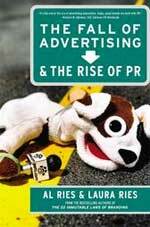 Reading The Fall of Advertising and the Rise of PR will definitely inspire public relations specialists. But do not be fooled. Advertising does have its place in establishing a brand. The authors ignored the many success stories where advertising has effectively built successful brands. I loved that book. Specifially the PR Outline that they offer. Good post! “Book Review: The Fall of Advertising and the Rise of PR | Marketing Monster” clermontdowntownpartnership was in fact a pretty awesome article, .